The first automated vehicles are now operating on Ontario roads through a pilot project involving cars developed by the University of Waterloo, the Erwin Hymer Group and BlackBerry QNX. Ontario has achieved an important first by putting automated cars on the road for the first time, but it still has a long way to go to catch up to competitors, according to a Canadian industry association promoting automotive innovation. 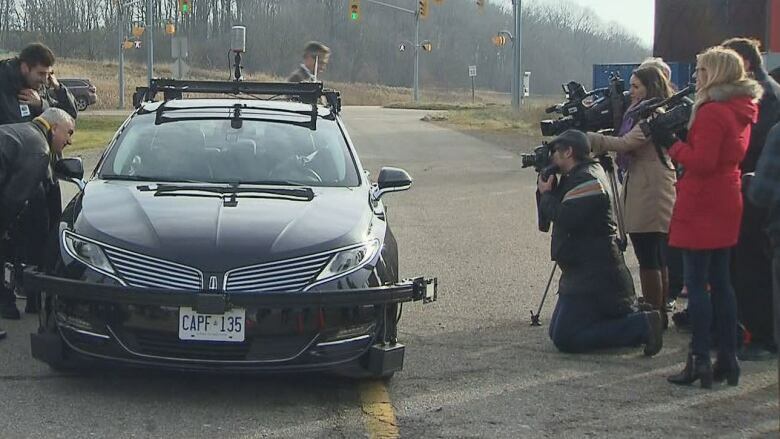 The first automated vehicles are now operating on Ontario roads in a pilot project involving cars developed by the University of Waterloo, the Erwin Hymer Group and BlackBerry QNX. Driverless cars: How will they impact Toronto in 2020? Three automated vehicles are to be tested beginning today in a development that could lead to fully self-driving cars. "Within Canada this is a first and it's a very important first," said Barrie Kirk, executive director of the Canadian Automated Vehicles Centre of Excellence. But Canada isn't putting the resources into the industry that its competitors are, he warned. "At an international level we have a lot of catching up to do, When I look at the G7 countries, we in Canada are dead last in developing self-driving cars. This is a big and important step forward, but we need a lot more deals like this." 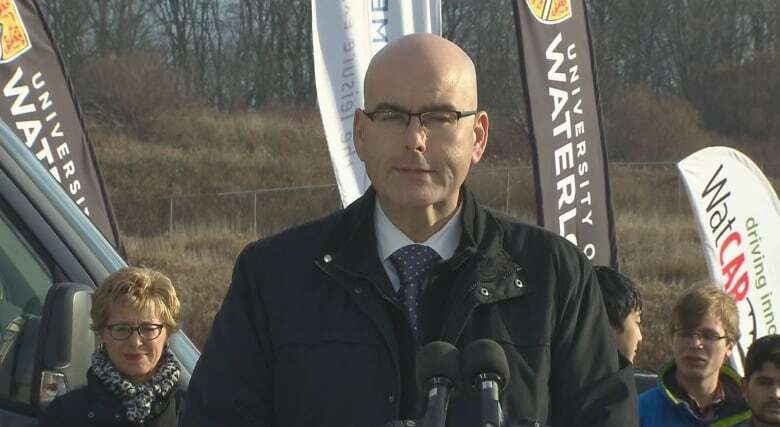 Kitchener-Centre MPP Daiene Vernile and Ontario Transport Minister Steven Del Duca arrived in an automated car for an announcement of the pilot in Waterloo, Ont., on Monday morning. Earlier this year, Ontario became the first province to set a regulatory framework to permit testing of self-driving vehicles, an emerging technology where the province is keen to be a leader. Del Duca called the technology the future of driving. "For Ontario, the benefits of being part of automated vehicle technology are clear — increased road safety, managed congestion, minimized driver distraction and easier movement of goods and services," he said. The province is investing $2.95 million over the 10 years of a pilot project to develop driving automation. "An automated vehicle supply chain is coming and we want those jobs to be here in the province of Ontario," Del Duca said. The University of Waterloo will be operating a Lincoln MKZ hybrid sedan, dubbed Autonomoose. The Erwin Hymer Group, an international automaker with a research centre in Waterloo, will be testing a Mercedes-Benz Sprinter Van. BlackBerry QNX will test a 2017 Lincoln and will be developing its software in association with the pilot project. "The age of the driver is over. The age of the passenger is beginning," said Joel Adams, director of engineering, for Erwin Hymer Group, a motorhome company that is seizing the initiative in this sector. The researchers are evaluating how the vehicles operate under various weather conditions and road conditions as well as various levels of automation. The cars are connected to the internet and have a system of visual sensors, as well as radar and sonar to detect road conditions and obstacles and communicate with other vehicles on the road. Technology allows the vehicles to maintain a safe distance from other vehicles without intervention from the driver. Will self-driving vehicles be safer? Kirk points out that 93 per cent of traffic collisions involve human error and predicts as many as 80 per cent of accidents could be eliminated with self-driving cars. "Self-driving cars will be much safer than human-driven cars, but not perfect," he said. Kirk said he was encouraged that the federal budget this year included money for Transport Canada to develop standards for vehicles. With Tesla, Google, GM, Toyota and others moving rapidly to develop self-driving technology, Canada has a lot of catching up to do, he said. Ford has said it will have a self-driving car in commercial production by 2021. "Ontario is doing all of the lifting, but it's still a small amount compared to what's being done elsewhere," he said.